Palm Springs was Sizzling in both temperature and softball action! 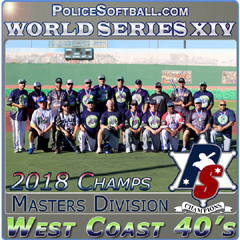 The greater Palm Springs area welcomed the police softball back to the desert for the annual West Conference Championships this past weekend. The two-day tournament was condensed down to ensure teams got the most amount of games over the shortest duration of time possible. Friday evening kicked off the round robin and there were no huge surprises. 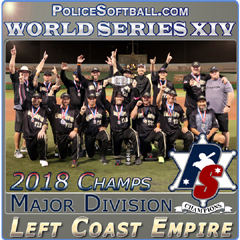 As expected, LAPD Blue, DEA Combo, CenCal Connection and the LA Lawmen earned top seeds in their brackets although the LA Lawmen did suffer a loss at the hands of SoCal Riot. The remaining teams to advance to the Majors Division playoffs were Riot, Border Patrol Arsenal, Cali-Force and the Degenerates. Nitro2Go Hitmen, Team Galvez, NorCal Warriors, San Francisco Seals, Coronado PD, RSD Force, Arizona Ablaze, Chicago Metro and North West Shakedown were all seeded into the Gold Division. North West Shakedown from Washington State earned the #1 seed by defeating Chicago and San Francisco in the round robin which meant they were the only undefeated team in Gold. The temperatures on Saturday morning were warm, but as the day progressed the thermometer was at triple digits. In the Gold first round Nitro2Go defeated NorCal Warriors, North West Shakedown remained undefeated with a win over Team Galvez, Chicago Metro handled RSD Force and Arizona Ablaze dispatched San Francisco. The two undefeated games saw Chicago Metro send Arizona Ablaze into the loser bracket and the red hot North West Shakedown did the same to Nitro2Go. In the matchup to determine who would advance to the “ship” North West Shakedown finally met their match as Chicago Metro rode the wave of momentum and earned a ticket to the dance and a well-deserved break from the action in order to let the loser bracket play out. Teams who ended up in the loser bracket early were essentially doomed because they would need to win up to 7 games in a row with no breaks in the 100-degree heat. Coronado PD, San Francisco, and Nor Cal Warriors were quickly eliminated and had time to cool off at the hotel pool before returning for the Silver playoffs. Arizona Ablaze was mounting a nice comeback by eliminating Galvez, Nitro2Go, and North West Shakedown in order to seek revenge against Chicago, the team that sent them into the loser bracket to begin with. Early in the game it appeared Arizona did not have enough gas in the tank to compete with the fresh Chicago squad. Rather than seize the moment, Chicago went flat and allowed Arizona to stick around. Eventually there was a change in momentum and suddenly the Arizona team appeared re-energized, as was their now vocal fan base. Arizona went on to win a close game and push Chicago to the dreaded “IF” game. Chicago never got their swagger back and Arizona capitalized by scoring early and often. Arizona accomplished the improbable, playing 6 games in a row and winning the final 5 in the blistering heat to be declared West Conference Gold Division champions! In the Silver Division, there was a huge upset as the San Francisco Seals upset the heavily favored NorCal Warriors to win the ‘ship. 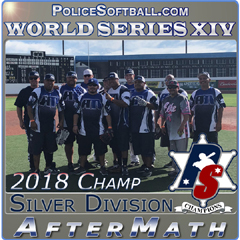 For the Seals it was their first Policesoftball.Com championship which is impressive considering this team is made of police officers all from the same agency, San Francisco PD. Their MVP was Steve Fillippi. We expect San Francisco to build on this win going into the World Series come October. 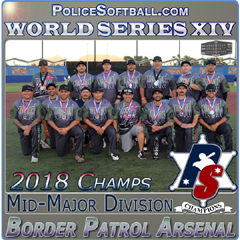 The Majors Division showcased the highest level of cop softball as nearly every team had rosters loaded with former minor league or college baseball players and high level civilian softball rated players. Let’s just jump to the end. As predicted by the “Swami-Ball” the LAPD Blue went undefeated in the tournament to claim their first championship since the reformation of the legendary franchise. Now that has been established, let’s talk about how it all went down. In the early going, what was supposed to be a lopsided affair between LAPD Blue and the single agency CHP Degenerates team ended up being a closely contested battle. Degenerates stood toe to toe with the LAPD Blue for 7 innings, exchanging head shots and body blows before finally suffering defeat at the hands of the loaded Blue team. Even in loss, the Degenerates earned respect and drew a lot of positive comments from the peanut gallery. The extremely short handed CenCal Connection got by a similarly shorthanded SoCal Riot and the DEA Combo took down the single agency Border Patrol Arsenal. 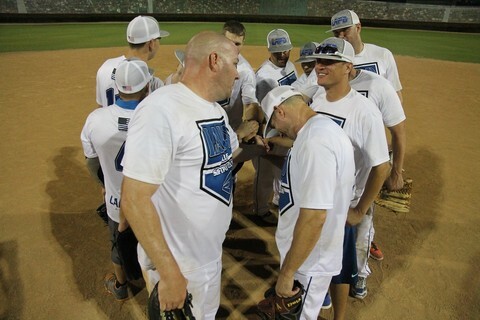 On paper, the LA Lawmen were favored over the Cali-Force team, but Force stepped up and sent the Lawmen into the loser bracket. A closer examination of the Cali-Force roster revealed a LOT of Cal-Quake genealogy… Les Lawson, Lowell Buck, GG Guerra, Mike Mayer, Robbie Rosas etc. along with HardCor legend Jimmy Sanders. These guys know what it takes to win. But all these guys are north of 40 years, some north of 50 years, so would they be able to sustain this level of performance in the heat? That was answered in the next game when the veterans from Cali-Force fell to the young LAPD Blue team. The Blue were debuting several young and ultra-talented players who were in their mid-20’s so they had fresh legs all weekend. To give you an idea of just how young they are, guys like Dave Braun and Mike Snyder are considered the “senior” members of the team, and those guys are smack dab in their prime years still. Meanwhile across the complex, the very short handed DEA Combo defeated the another team with a skeleton crew, Cen Cal Connection. This set up the undefeated game between the DEA Combo and LAPD Blue. These friendly rivals are no strangers, but when the game started it was all business. A few newbies in particular stood out on the Swami’s scouting radar. For the Blue it was Shain Stoner and Andrew Jenkins. For the DEA it was the wonder boy Matt Vargas. As expected the game was a great contest but as you already know, it was the Blue who prevailed and advanced to the ‘ship. In the loser bracket, the LA Lawmen punished the Degenerates but then had the tables turned as they were eliminated by Cen Cal Connection. Meanwhile SoCal Riot went on a run by defeating Border Patrol Arsenal and Cali-Force. Riot would later fall to Cen Cal Connection and Cen Cal would be eliminated by the DEA Combo. Cen Cal only lost 2 games all weekend, but those were at the hands of the DEA Combo. Early in the season Cen Cal was projected to bypass the DEA in the rankings…well, the DEA answered with their own projections. Many in attendance stuck around to watch the DEA Combo match up against the LAPD Blue in the final dance. LAPD Blue would need to be double dipped, and some wondered if they might be a little snake bitten after what happened previously in Reno. We were shocked to see the DEA field only NINE (9) players for the first two innings. Of course, the LAPD Blue jumped out early and never looked back. Yes, eventually the DEA brought in a 10th player but the damage was done. The Blue was not going to be denied as their hitting was relentless and their defense was seemingly impenetrable. The DEA Combo battled hard, but it was LAPD Blue’s moment in the spotlight as they were crowned West Conference Champions! In Mid-Majors, the Degenerates out of the Oakland area won back to back intense battles against Cali-Force and then Border Patrol Arsenal to claim the victory. Both games were back and forth so the Degenerates were put to the test against high caliber competition and were able to earn their stripes. The championship game against Border Patrol Arsenal in particular proved that the young Degenerates team won’t fold under pressure. They rallied back in the bottom of the 7th to put the winning run on 3B with 2 outs. Arsenal made the textbook calculated decision to walk the bases loaded in order to create a force situation at all bases. In this instance it benefitted the Degenerates as they won via a walk off base on balls. Both teams are to be congratulated for playing such an intense game, in the blistering heat, after a long weekend of softball. The Degenerates MVP was “Macho Man” John Savage. Policesoftball.com thanks all the teams that came to the event. 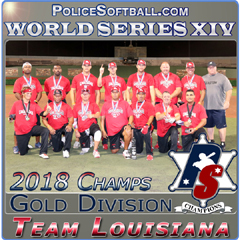 It was disheartening to have so many teams drop out shortly before the event and the overall apathy toward the event by those who did not attend, but for those who did come we are confident they enjoyed a high caliber event and PLENTY of competitive softball. We always put softball first. 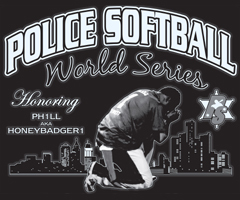 For those who are serious about POLICE SOFTBALL please continue to support the events listed in our Upcoming Tournament section. 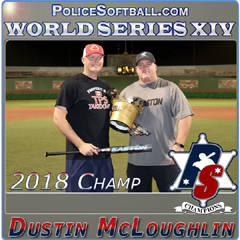 If for some reason you could not make it out to Palm Springs, the birthplace of Policesoftball.com, please consider scheduling it next year as we will try to move it into April/May. And extra special thanks to Brett Helmer and Easton Sports for providing us bats to use, along with sponsors Garrett Metal Detectors and Play Softball in the Dominican Republic.